View More In Media Storage & Organization. 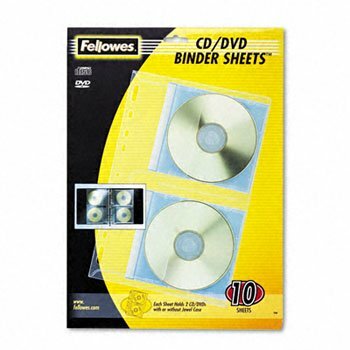 Clear looseleaf sheets with individual pockets Sheet holds two CDs, with or without jewel cases. Ten sheets per pack. Clear looseleaf sheets with individual pockets Sheet holds two CDs, with or without jewel cases. Ten sheets per pack. Global Product Type: Media Sleeves; Media Sleeve Type: Refill Sheet; Media Stored: CD; DVD; Capacity (text): 2.